Posted on Mon, Apr 29, 2013 : 5:58 a.m. The location of the proposed $12 million recreation center, pictured here, is being looked at as the city's master plan process has produced a new vision for the site. That vision includes extending River Street through the Water Street property, which could affect the location of the center. The location, size and feasibility of the proposed $12 million Water Street Eastside Recreation Center project in Ypsilanti are being re-examined as the project moves forward, yet city and county officials are optimistic the Water Street development will occur. "Right now we're watching the city go through its master planning process," said Bob Tetens, the Washtenaw County Parks and Recreation director. "We don't know what that's going to do to our proposal. ... Right now we've got an agreement to work on a certain amount of land on the northwest corner. ... Some things I've seen have been in conflict with our proposal." During the city's master plan process, planning consultants have discussed potentially moving the recreation center development farther back on the Water Street property. However, Tetens said the county reached an agreement with the city several months ago regarding the location of the center and that's what he hopes to continue move forward with. "Any other site has other issues associated with it," Tetens said. "We want to be on the busiest road in the community. We want to be adjacent to the trail and adjacent to the river and that's what the northwest site gives. "We have already come to an agreement that we'll be at the northwest corner. That's what we proposed and that's what the city agreed to. To talk about any other site is counterproductive and speculation at this point." 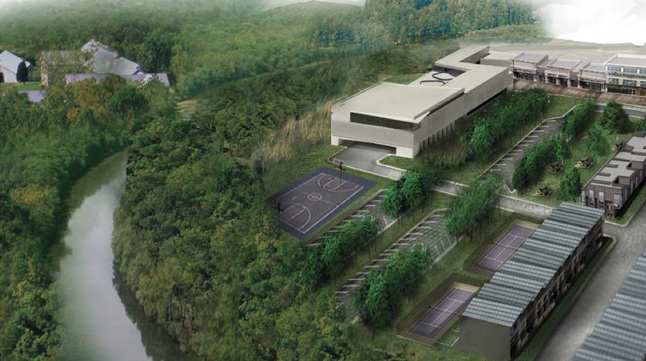 A bird's eye view of the proposed recreation center. 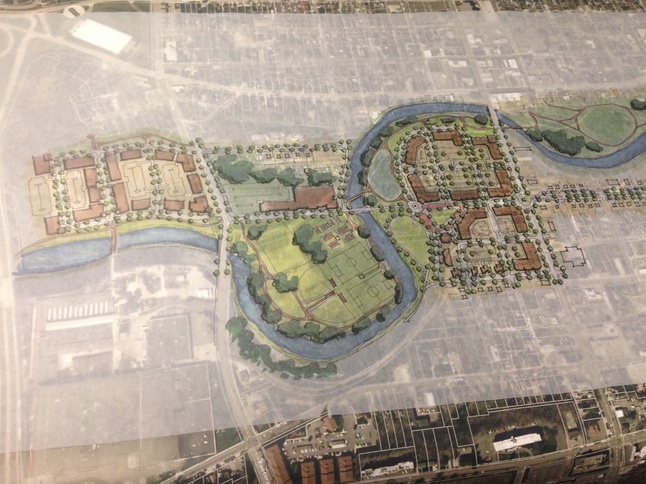 Tetens said the design scheme will likely evolve over the next year. However, Tetens said he's confident the project will continue to move forward. "I'm confident we're going to be able to construct a facility on the northwest corner," Tetens said. "I'm confident we're heading toward that conclusion. I certainly hope so because we've invested a lot of time and energy into the project." The county's parks and recreation department entered into a partnership last year with the city of Ypsilanti, and the Ann Arbor YMCA. Parks and Recreation would enter into a lease agreement with the city for the land and the YMCA would oversee the day-to-day operations. The center would be nearly 60,000 square feet and would be much like the Meri Lou Murray Recreation Center that opened in 1991. The center would be equipped with a swimming pool along with various aquatics, a locker room, gym, fitness facility and other amenities. The center also would offer classes. Officials still expect construction to begin in 2015. It would occupy between eight to 10 of the 38 acres on the Water Street at the northwest corner of the property off of Michigan Avenue. Should the location and size change? Ypsilanti Mayor Paul Schreiber said at this point, he believes everything is still in the negotiation stage, although he acknowledged the city is aware the county would like to move forward with the initial plan. "The Ypsilanti City Council, we didn't really have a plan for the site," Schreiber said. "I wish we could have had a plan sooner, but we have to deal with the reality opposed to what we wish. I still think it's a great use and idea, but we have to figure out what is best for the city and best for the county parks and recreation and the residents on the east side of Washtenaw County. I hope that we can actually negotiate both on the city's side and the parks and rec side. I think it's going to take a little more time." Schreiber said he met with planning consultant Ian Lockwood, City Planner Teresa Gillotti and Tetens about a week ago to discuss the recreation center and present some of the ideas that have come up during the master plan process. "The county parks and rec want to do a project now and rightfully so," Schreiber said. However, one of the ideas being proposed is conforming the site to a grid structure and running River Street through the property to Factory Street. "That would be a pretty large recreation center," Schreiber said. "There's a possibility of having a smaller recreation center that would be on the Water Street property that could fit in with the grid structure that's being discussed with the master plan. I think that's a smaller design than what the county was thinking." Schreiber said there are three possible options moving forward. The first could be to keep the location as orignally proposed, have a smaller recreation center that would fit in with the grid structure or potentially move the recreation center entirely off of the Water Street property. "I haven't made up my mind on what I want," Schreiber said. "I want to get more information and get the marketing study back and I also want to see what the county's parks and rec is interested in doing." Schreiber said he has yet to decide where he believes the proposed recreation center should go. The YMCA is conducting a market study to determine the feasibility and the impact of the recreation center. The market study should be done within the next two weeks. Tetens said the study is something the YMCA conducts across the country as it looks at potential sites for development or management. The study also will examine and determine the appropriate size of the property. "Hopefully that will also provide some direction," Schreiber said. "I see this as being a good thing that the county wants to put a rec on the east side and I just want to make sure it's going to be a good thing that goes in the Water Street property." Council Member Pete Murdock said when the city first started discussing the recreation center in 2011 with the county, council initially expressed interest in having the property located elsewhere. Murdock said it's too late to go back and change the location now. "We had a big discussion," Murdock said. "I think the location has already been decided and if we want to renege on that we can do that, but the parks people have basically said that's a deal breaker with them going back there. ... Extending River Street is a very expensive project, which is not likely to happen. I think it may be a nice plan, but it's not very viable." Murdock said moving where the rec center would be located isn't a "realistic option." Murdock noted that the project was supposed to begin construction this year. "We don't have the funds to develop the plan," Murdock said. "If we're talking about having a rec center, I think we need to be talking about what we already agreed to instead of reneging. We can't keep changing the rules as we go through the process." The results of the marketing study will be completed in two weeks, officials said. 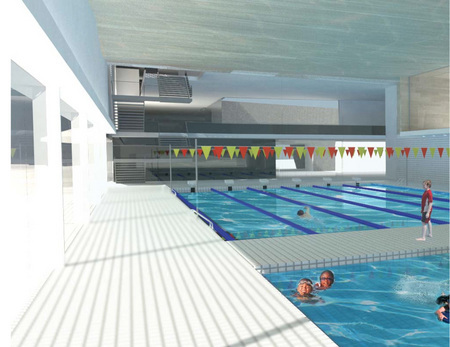 A proposed concept of a pool at the Eastside Recreation Center. Completing the pedestrian bridge that will run through a portion of the Fischer Honda property in 2013. Completing the border to border trail in 2014. Beginning the construction of the recreation center in 2015. "Late this summer, activity will probably start to occur on all of this project," Tetens said. Tetens said the external look of the recreation center will also change over time. Tetens said the structure will not be comprised of just steel and glass and he hopes to add some sort of color texture to it. "Once we have a good idea and everyone is in agreement, we can send it out for construction bids," Tetens said. "It depends, we have a lot of cooks in the kitchen on this one. We want everyone to have input and to feel good about the final project." Tetens said the parks and recreation's millage renewal will take place in November 2014 and until that happens, he said it's unlikely any construction contracts will be signed. Tetens said the parks may also have to bond to cover part of the costs. However other parts of the project can move forward, he said. Schreiber said every project has a period of "heartburn" where those involved may not agree, but he doesn't think it will impede the project. "I hope everybody takes this slow and deliberate and I think with any project there's heartburn involved," Schreiber said. "This is part of the project and I'm in it for the long haul." "We’re still proceeding and think it’s a great project," Tetens said. "The city has been a partner with this." Tue, Apr 30, 2013 : 1:38 p.m.
Ug, what a non article. There was no point to this. The plan is in progress, continuing well, and there are no new developments. The city master plan updates will not have significant impact on the rec center. I know you're paid per article but this is just silly. Tue, Apr 30, 2013 : 1 a.m.
Are you kidding me? The Rec Center is the ONLY thing this property has going for it. To pretend otherwise is sheer folly. Build the darn center wherever the county wants and be happy about it. Mon, Apr 29, 2013 : 8 p.m. It seems that nothing is quite good enough for this property. There's interest from a chain, and that's no good, or it's suburban (? ), and that's no good. This is a classic situation where perfect has become the enemy of the good. I do hope that the city council doesn't drive off what would be a welcome addition to the community just because they haven't got just the right situation in hand. It would be wonderful to make this property a small farm incubator or some such, but surely there is someone there willing to get something more reality-based done. Mon, Apr 29, 2013 : 6:51 p.m. The commentators are right. We should be saving this prime location for all of the businesses and investors that have lined up for a crack at the prime piece of property. Do you think we'll be able to squeeze in a Rec Center next to the Burger King and Family Dollar? Come on folks. This property is utterly valueless as it stands now. Almost no one wants any of it, other than the Rec center and a dollar store. Yes, it would be great to keep it all on the tax rolls. It would be nice to have it fit the grid, and to have a bridge with a through street all the way to the freeway on River. But back here in reality, we're closer to bringing in a Emergency Financial Manager than we are building an $8mil bridge. Developing a recreation center to add value to the downtown area is close to reality. Commercial development of that parcel remains a fantasy. We can't keep throwing the dice on fantasies we can't afford while we let reality pass by. The rec center is all but a done deal, why would we try to derail it now? Oh, then there's the matter of having already signed an agreement to work with the county on the parcel along the river. How is it going to look to any developer if we try to pull the rug out from this deal too? Not only do we reject all business proposals because they don't &quot;feel&quot; right, we can't even let someone gift us a rec center, because someone, someday, might want to pay taxes on that property. Who in their right mind would try to do business with us? Mon, Apr 29, 2013 : 9:56 p.m.
Mon, Apr 29, 2013 : 7:09 p.m.
Every time Andy opens his mouth, the value of my house drops ten percent in value. I think the recreation center should go on Michigan Avenue near the bridge, but I wish people wouldn't say the property is worthless. It's a self-fulfilling prophecy. Think that your town is worthless and other people will think it's worthless too. Mon, Apr 29, 2013 : 5:23 p.m. Seems pretty close to the water. As long as AA city taxpayers aren't kicking in for this, go for it. What about the huge facility that Washtenaw Community College built recently? Doesn't that serve the Ypsi population? I'm just wondering how many people can support these facilities. The Meri Lou Center in AA keeps raising prices constantly. Mon, Apr 29, 2013 : 9:53 p.m. These are good questions and that is why I support putting it where the consultants see it, on Waterworks park, closer to the township, closer to I-94 and farther away from the other options you mention. That property is also already off the tax roles. Mon, Apr 29, 2013 : 7:54 p.m.
That WCC facility is very expensive compared to the county rec center. it's lovely, but the two don't compare pricewise. Mon, Apr 29, 2013 : 4:10 p.m. The main reason Ypsilanti faces an ongoing structural budget crisis is because so much city property is already off the tax rolls (EMU, churches, public property, non-profits, etc.). On the other hand, the Water Street site represents a tremendous opportunity for new investment that will be capable of generating much-needed revenue -- but only if that new development is taxable. I think everyone appreciates the County's willingness to consider building a new recreation center in Ypsilanti, and I think most people are enthusiastic about the concept -- but like many of my neighbors, I don't understand this continued insistence that the only option for building it is on that (prime) northwest corner. Given the size of the Water Street site (38 acres), and the ample availability of public (non-taxable) property around it, is there *really* no way this proposal cannot be reconfigured to provide the benefit of a new recreation center while still preserving our opportunity to develop the most prime parcels (adjacent to the Huron River, Downtown and Michigan Avenue) in the way that makes most sense for our community in the long-run? Mon, Apr 29, 2013 : 3:11 p.m.
We don't have money to extend river street with a new bridge right now. The city doesn't own the land across from water works park. There are no other private developers on the table right now with any other plans. JUST BUILD THE REC CENTER. Who cares if it's on the best part of the property. Maybe it should be! It will be the anchor that draws in more development. Trust in that and move forward, PLEASE. Tue, Apr 30, 2013 : 1:52 p.m.
Stephen, staff members are not paid per article. Tue, Apr 30, 2013 : 1:45 p.m. The rec center is moving forward. This is a silly and pointless article. Katrease and all the other bloggers on a2dotcom get paid per article so we end up with nonsense like this. Mon, Apr 29, 2013 : 2:50 p.m.
Three questions: 1. If you put the Dollar store and it's parking lot on Michigan Avenue along with the Washtenaw County Rec Center on the Northest corner on Michigan Avenue, how much property is left over for future development along Michigan Avenue? At this time with no other planning on the site as Mr. Murdock and others are suggesting, Michigan Avenue is what we have to offer. No roads or any sort of grid on the property so no opportunity for internal deelopment. 2. What is the potenial traffic pattern along Michigan Avenue if these things are put on the street like this, especially in the hours after work when people are likely to use them the most? where do they turn in and go out? 3. What is the potential impact on local businesses already established and paying taxes like the Ypsi Studio, the Karate and Judo Classes on Park Street and the ballet and other classes in the Riverside arts Center located nearby? I'm not against these new projects, but we do not want to create problems for them or for other existing or future opportunities for the city by not thinking things through. This should not be a fight. Our Mayor is right to wait for the information to come in, and if the county really wants to work with the city they will be interested in this information themselves. It is in everyone's best interest including theirs. You could answer some of your own questions with a little research. There would still be plenty of room in between the rec center and family dollar. The entrance for the rec center would most likely be located at River street and share it's traffic light. Impact upon existing small businesses should be minimal. We can answer these questions NOW and move forward, not dither around in the ether and claim that we don't know enough yet. Mon, Apr 29, 2013 : 2:18 p.m.
A suburban rec center should not be allowed to happen on Water Street. It will cut off the entire property from downtown. Mon, Apr 29, 2013 : 3:08 p.m.
Mon, Apr 29, 2013 : 1:34 p.m. The county has a viable plan for a solid use of a portion of the very large Water Street property that the city removed all private property-holders from a decade ago --- and now, city officials are proposing to alter the location of the county's Recreation Center, to a less attractive part of the Water Street estate, on the grounds that a &quot;grid&quot; can be created, with massive public investment to create new roads! The city managers have gone INSANE if they seriously think this is a viable plan. Stick to the agreement with the county, and move forward on using the NW corner for the Rec Center, as agreed! The insanity that created the original fantasy of a privately financed neighborhood on brownfield lands was previously unequalled, but the apparent current willingness of Ypsilanti planners and the Mayor to delay the County's plans may equal the original Water Street insanity. The county is the only serious entity to ever come forward with realistic plans for invested in Water Street. Quit delaying agreement on the possible for fantasies of a utopia where you can get whatever you desire, using unspecified sources of private or public capital. Get real, or face another decade of an empty Water Street project! Mon, Apr 29, 2013 : 3:01 p.m.
Have to agree with you. We cannot afford to lose this rec center by pining for broader Utopian dreams. We don't have money to extend river street with a new bridge right now. The city doesn't own the land across from water works park. There are no other private developers on the table right now with any other plans. JUST BUILD THE REC CENTER. Who cares if it's on the best part of the property. Maybe it should be! It will be the anchor that draws in more development. Trust in that and move forward, PLEASE. Mon, Apr 29, 2013 : 1:13 p.m. The never-ending roadblocks created by the city's so-called 'planners' and the laughable dysfunction that is Ypsilanti city government are writing on the wall for county parks and recreation officials. Whether relocated to Ypsilanti Township or another reasonably close location outside of the City of Ypsilanti, the county will be assured of a much more streamlined approval process and actually get the new center constructed. The city has blown the opportunity and the citizens of this part of the county should not be held hostage by City of Ypsilanti sleazy politics and staff incompetence. It's time for the county to move forward with its mission. Mon, Apr 29, 2013 : 1:15 p.m. Really??!! That's what you're taking out of this? Mon, Apr 29, 2013 : 12:12 p.m.
We all need to take a pause here and consider the new master plan proposal. Per the drawing, which resulted from thousands of hours of discussions and considerations, I think it looks pretty good; the first real plan I have seen for the Water Street area that makes sense. Note the size of the newly proposed recreation area with not only buildings but athletic fields too. And note the easier access to the I-94 intersection. Why wouldn't the County be interested in this concept? We need a little flexibility here as we work to plan Ypsilanti's future and we need to start sticking to what looks like our plan. This new location would be good for everyone, especially the citizens of Washtenaw County. Tue, Apr 30, 2013 : 4:29 p.m.
Dave H., you always make me smile no matter what alias you use. Mon, Apr 29, 2013 : 2:14 p.m. If the City doesn't own the land, then the County can buy it from whoever does own the land. 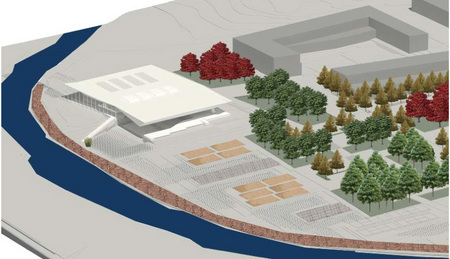 Its the idea here that I like, an expanded recreation area in a place that makes more sense. It was the consultants who came up with the idea, I just support it. Mon, Apr 29, 2013 : 12:32 p.m. The problem with the proposal to put the rec center in the area south of the Water Street project is that the City doesn't own that property. The City doesn't own the property west of the newly envisioned South River Street. Mon, Apr 29, 2013 : 11:01 a.m. The mayor says &quot;I haven't made up my mind on what I want&quot; and that every project has a period of &quot;heartburn&quot; involved. These are not words that should be coming from a leader's mouth. Mon, Apr 29, 2013 : 10:56 a.m.
&quot;Schreiber said there are three possible options moving forward. The first could be to keep the location as originally proposed, have a... recreation center [that is more vertical &amp; with a smaller footprint] that would fit in with the [street] grid structure or potentially move the recreation center entirely off of the Water Street property.&quot; I've deliberately edited the second option because having listened to the planners talk about their ideas, that is really what they are discussing as the second option. We have a facility like this, the downtown Ann Arbor YMCA, which works wonderfully and is 4-5 stories tall. In contrast, the county is considering a one or two story building with extensive parking lots with a footprint that covers a lot of ground. It would be much better if the new rec center were integrated into a larger complex with mixed uses such as housing &amp; office space above or adjacent &amp; parking decks that served multiple buildings that maximized intensity of the use of this land. During the meeting I had arranged a couple of weeks ago where the world's foremost &quot;New Urbanist&quot; urban planner, Andres Duany, donated a couple hours of his time to meet with Ian Lockwood, members of his team, the city manager, Ralph Lange and City Planner Teresa Gillotti, Duany was very pointed in his comments that a suburban style rec center that had extensive parking &amp; that did not fit into the new street grid would be less than the *ideal scenario*, which is what I outlined above as the second option, a recreation center that is more vertical &amp; with a smaller footprint that would fit in with the street grid structure. Mr. Duany stated if the river waterfront land has extensive parking lots &amp; low buildings that absorb the views along it, the interior property is devalued. To be most successful, Water Street should be more intensely developed as part of a downtown-style city grid, &amp; be not just another suburban development. Mon, Apr 29, 2013 : 4:17 p.m.
@beardown: The second article in two days, actually. I have tremendous respect for the man. Andres Duany is truly one of the best urban planners in the world. Ask any urban planner or just go to the library and read his most famous book, &quot;Suburban Nation: The Rise of Sprawl and the Decline of the American Dream&quot;, and you'll gain some insight into why we all think that way about Mr. Duany. It's actually a quick read and written for a general audience. Over the years I've probably handed out as gifts 30-40 copies of the book. It's brilliant! Are you Duany's publicist? This is the third or fourth article in a couple of days where you have citied him as the all knowing expert of what to do with Ypsi's financial sinkhole. Mon, Apr 29, 2013 : 10:38 a.m. So how long has the city had the property? How long have they had to develop a master site plan? They start doing it AFTER they have already gotten proposals for building? Wow. Talk about ineptitude. They're going to end up losing both deals and go broke paying back the loans. Beginning to feel like the Ann Arbor city council is running the show. C'mon Ypsi. Ya gotta do better than that. Tue, Apr 30, 2013 : 1:37 p.m. This is the city's master plan. Not the site's. This is a normal and necessary part of being a city. If you're going to whine about Ypsi go somewhere else. @YpsiGreen: There was a master plan in place from the start of this project. This is an update and major refresh since so many years have gone by. You can read all the original plan documents on the city's Water Street website.